In Internal Combustion Engine, some particular terms are used to describe the process. 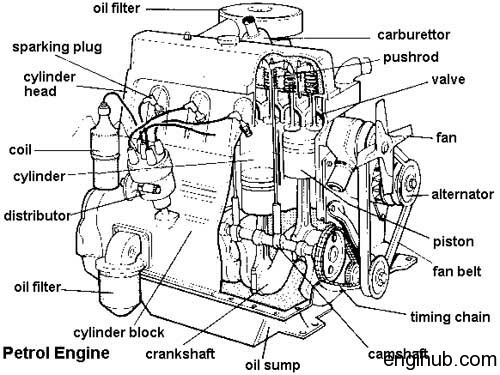 For example, carburetion, scavenging, firing order, detonation etc. Actually, these terms are the one word for that particular activity. It might possible, an automobile engineering or mechanical engineering concern person is well familiar with these terms. Here I am sharing the information on I.C. Engine Terms, keeping in mind a common person. Hence, everyone will get familiar with these important terms. The process of breaking up the fuel into minute particles and mixing it with air is called “Carburetion”. This term is mostly used in the internal combustion engine, which has low compression ratio and which use highly volatile liquid fuels such as petrol. The process of breaking up fuel in minute particles is known as “Atomization“. A carburetor is a device where all the carburetion takes place. “Scavenging” is the process of removing burnt exhaust gases from the combustion chamber of the engine cylinder. In four-stroke cycle engine, the piston pushes the burnt gases to exhaust manifold during its exhaust stroke. In the two-stroke cycle engine, a blast of fresh charge is made to enter at higher Velocity into a combustion chamber at the end of working stroke and thus drives out burnt exhaust gases. “Compensation” is the process of providing additional fuel or reducing the fuel by certain means. It will correct the mixture strength to meet the varying nature of speeds and load on the engines. This process is mostly used in simple carburetor especially used for automotive purposes. The sequences in which firing or power impulses occur in an internal combustion engine are called “Firing Order”. This term, firing order should be such that there is always a proper balance and it does not cause vibrations. Some sudden and violent knocks are experienced in internal combustion engine at sometimes. These knocks are known by “Detonation”. This term is set up by a high-pressure wave giving a loud pulsating noise as it strikes against the cylinder walls, cylinder head, and piston. It should be noted that detonation is not pre-ignition but something, which occurs after the spark, has started the ignition. The process of adding a small quantity of Tetraethyllead to suppressing the detonation in a petrol engine is the terms called “Doping”. If the tetraethyl lead used in a large proportion, there are chances of engine damage. This happens due to the deposition of lead oxide in the combustion chamber. A high-pressure wave set up in compression ignition engine (Diesel Engine), which causes knocks. So, this knock is called as “Diesel knock”. It badly affects the engine efficiency and power drop; also engine runs very rough due to diesel knock. If a mixture of gases is heated to a very high temperature, the vibrating molecules of different gases make violent encounters. Resulting in splitting up of the compound molecules into smaller molecules which recombine to form their compound molecules as the temperature lowered. The phenomenon is called “Dissociation”. The dissociation is mainly due to breaking up of carbon dioxide into carbon monoxide and oxygen. The process of increasing the weight or density of air-fuel mixture or compressed air, induced into the cylinder during the induction stroke is the terms known as “Supercharging”. This is achieved by a separate compressor and known as supercharger or blower. When the atomized fuel injected into the combustion chamber of compression ignition engine may be burnt efficiently there should be a high relative velocity between the air and fuel so that a thorough mixing takes place. Hence this is achieved by “Turbulence”.